Vijayawada, the second most populous city of Andhra Pradesh is home to a large number of vehicles, with two-wheelers being the preferred mode of transport in the city. Official reports stated that the city had 4.5 lakh vehicles as of 2004, with this number increasing at a rate of around 10% each year. Currently, the city has around 7.5 lakh vehicles, with the road network spanning over 1,250 km. Given these numbers a number of accidents are witnessed in the city, most of them involving bikes. The recent decision of the Supreme Court to ban BS-III compliant vehicles saw residents of the city rushing to buy bikes, with dealers offering discounts ranging between Rs.15,000 and Rs.25,000. A good two-wheeler insurance policy can help offset the financial loss associated with an accident. While the government has made it mandatory for all vehicles to have an insurance policy, it is upto the rider to determine the kind of policy he/she wishes to invest in. Given its proximity to Amravati, the new capital of Andhra Pradesh, Vijayawada is a key city in the state. A number of companies have established offices, with over 30 general insurance organisations offering two-wheeler insurance here. Individuals looking to invest in a good policy can choose from any of these popular names. 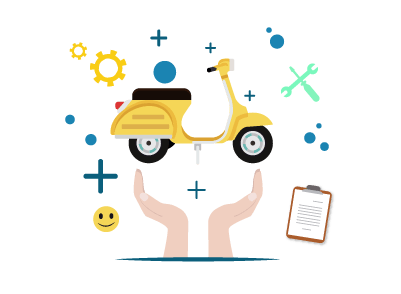 One of the key benefits of having a two-wheeler insurance policy is that one can get damages fixed at network garages of the insurer. Almost all insurance companies offer this service, helping them improve their customer ratings. Individuals who wish to get their bike fixed at a cashless garage in Vijayawada can locate one by using any of the following means. Check the official website of the insurer and navigate to the section which talks about network garages. Most insurers provide this facility online. Get in touch with the agent who sold them the policy and ask him/her about network garages in the city. Check the mobile app of the insurance company and search for garages here. Get in touch with company representatives on the customer care number and ask them to provide a list of all network garages in the city. Check the brochure to see if it carries the information. Faster – Network garages are typically more efficient than regular garages. They share a close relationship with insurance companies and are often professional in their working. As such, one can expect them to fix the repairs and deliver the bike quicker than regular garages. Simple process – The entire process of getting a bike fixed at a network garage is simple. An individual is expected to inform the insurer, with the insurer handling all communication regarding the repair. A few basic documents need to be submitted for the same. Additionally, one needn’t haggle over the cost of repairs. Limited spending – When the vehicle is fixed at a network garage it is the insurer who settles the bill. This means that a policyholder need not pay any amount from his/her own pocket in most cases. Payment might be required only if the cost of repairs exceeds the cover amount. Quality – Getting a bike fixed at a local garage often comes with its share of risks. A number of such garages are known to replace original parts with duplicate spares, compromising on the safety of the vehicle. This, however, isn’t a concern when a bike is given to a network garage. One can be rest assured that genuine spares are used to fix any damage. Additionally, most network garages hire expert mechanics and technicians, enabling them to fix complicated problems. Additional services – Certain network garages offer services like home pickup and delivery of vehicle, roadside assistance, towing, etc. Replacement vehicle – It is possible for an insurance company to offer a replacement vehicle while the damaged vehicle gets fixed in a network garage. This feature might vary from insurer to insurer. Given the number of options in the market it is possible for one to get confused while buying a bike insurance. Keeping these simple points in mind can help one zero in on a policy suited to their needs. Premium amount – The premium shouldn’t become a financial burden. It is possible to get a better offer on premiums by comparing different policies. Individuals who haven’t made any claim in the past are also eligible to get discounts on the premium amount. Insurers compute the premium by taking factors like the age of the vehicle, city of registration, engine capacity of the bike, etc. into account. Policy term – Choosing a longer policy term can help in reducing the premium amount. Currently, insurers offer policies with terms ranging between 1 year and 3 years. Opting for a longer term also reduces the hassle of renewing the policy each year. Cover type – One can choose between a comprehensive cover and a liability-only cover. The comprehensive package is more expensive but is a smarter option given road conditions in India. Claims process – Opt for an insurance company which has a good claims settlement ratio. This can be extremely beneficial in times of an accident. Inclusions – Check all the inclusions and exclusions carefully. Failing to do so might result in the policy offering limited protection. Network garages – Ensure that the insurance company has network garages in the city where the vehicle is likely to be used. With the recent bifurcation of Andhra Pradesh into two states it is possible to see a number of vehicles which are registered in different states ply on the streets of Vijayawada. Individuals who wish to purchase a used bike which is registered in a different state can do so without any problem. However, one should remember to transfer the insurance policy to the new owner to avoid complications in the future. Transferring ownership of the policy is simple and can be done by following these basic steps. Intimate the insurer once the vehicle has been sold. Submit details of the sale to the insurance company. Documents like the NOC, registration certificate, sale deed, etc. need to be submitted. The buyer is expected to submit his/her personal details to the insurance company. Any fee (if applicable) should be paid. On verification of all the documents the insurance company will transfer the policy to the new owner.